During Everest Base Camp trekking trail. Everest base camp Jiri trek is the combinational trek that takes you two of the fascinating trekking destination of Nepal. This Everest region trek is popular for its natural and cultural sightseeing tour. This trekking is regarded as the most traditional trekking trail of Everest region. This trekking route is popular from very ancient time and carries a historic significance. This is the same route which was used by the early expedition teams to climb Everest from Nepal part. Sir Edmund Hilary and Tenzin Norgay Sherpa, who were the first successful climbers of Mount Everest and they went through this trail to climb Mount Everest. Everest base camp trek offers you delighted mighty Himalayas panorama, lush green forest, beautiful natural landscape, Sherpa cultural villages, snowcapped surrounding and many more beautiful sightseeing places and beautiful surrounding. This trekkingusually starts from Jiri after six hours of drive from Kathmandu with a beautiful views on the way .As you arrive in Jiri you go through following the places of Shivalaya, Bhandar, Set, Junbesi, Nuntala, Bupsa, Ghat. As you come to Ghat, then from here we follow the current popular route from Lukla. While trekking we visit extremely delightful Sherpa villages and community and baize in their culture, where you'll meet friendly people and reflect the colors, sights, and sounds of village life as well as the spirituality of Tibetan Buddhism so prevalent in the Himalaya. You can also experience with famous monasteries and gumba on through this trekking region. This trekking can enhance your nature desire and help you gain memories of lifetime experience. Upon your arrival we assist you from international airport to our hotel. Enjoy evening dinner program and rest overnight. Day 02: Drive from Kathmandu to Jiri. Today we drive a scenic route for 9-10hours from Kathmandu valley all the way to Jiri. Rest overnight. Day 03: Jiri to Shivalaya. Today we start our trek from Jiri walking for 4-5hours all the way to Shivalaya. Rest overnight. Day 04: Shivalaya to Bhandar (2150m). Today we trek from Shivalaya walking for 4-5hours all the way to Bhandar. We trek through some of the most beautiful sightseeing places and cultural villages around. Rest overnight. Day 05: Bhandar to Sete (2357m). Today we trek from Bhandar walking for 5-6hours into Everest region all the way to Sete. Rest overnight. Day 06: Sete to Junbesi (2670m). Today we trek from Sete walking for 5-6hours all the way to beautiful Junbesi. Explore around and rest overnight. Day 07: Junbesi to Nuntala (2220m). Today we trek for 5-6hours all the way from Junbesi to Nuntala. Rest overnight. Day 08: Nuntala to Bupsa (2360m). Today we trek from Nuntala all the way to Bupsa. 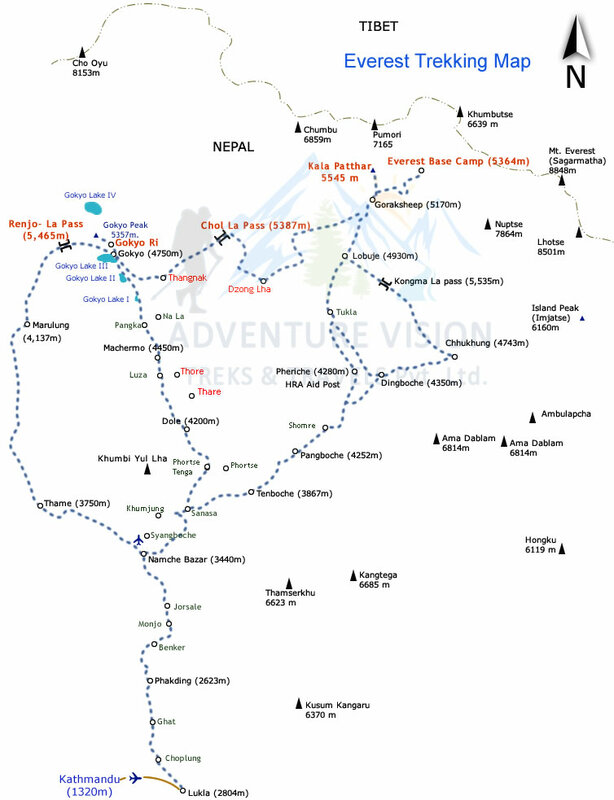 We walk for 4-5hours following the trekking trail to Everest region. Rest overnight. Day 09: Bupsa to Ghat. Today a scenic trek from Bupsa all the way to Ghat. We trek for 4-5hours following the scenic route of Everest region. Rest overnight. Day 10: Ghat to Namche (3440m). Today trek from Ghat to Namche Bazar trekking for 5-6hours. Rest overnight. Day 11: Day for acclimatization in Namche Bazaar/ Explore to Syangboche and Khumjung Village. Back to Namche Bazaar. Today full day acclimatization and exploration day at Namche bazar. Explore the sightseeing and cultural places around. Rest overnight. Day 12: Namche to Tengboche (3867m). Today we trek from Namche Bazar all the way to Tengboche. We trek for 5-6hours following the scenic route and rest overnight. Day 13: Tengboche to Pheriche (4280m). Today we trek for 5-6hours all the way from Tengboche to Pheriche. Rest overnight. Day 14: Pheriche to Labuche (4940m). Trekking for 5-6hours today we trek from Pheriche all the way to Labuche. Rest overnight. Day 15: Labuche to Gorakshep. Early hike to Kalapattar (5545m) back to Gorakshep (5170m). Today early morning hike to kalapatther. Enjoy the scenic Mountain View and trek all the way to Gorakshep. Today we trek for 6hours. Rest overnight. Day 16: Gorakshep to Everest Base Camp. Trek back to Labuche. Today we trek from Gorakshep to Everest base camp. Explore around and then trek all the way back to Labuche. Rest overnight. Day 17: Labuche to Pengbuche. Today we trek from Labuche to Pengbuche. We walk for 5-6hours ascending. Rest overnight. Day 18: Pengbuche to Namche Bazaar. Today trek for 5-6hour ascending from Pengbuche all the way to Namche Bazar. Rest overnight. Day 19: Namche to Phadking. Today we trek from Namche all the way to Phadking walking for 5hours. Rest overnight. Day 20: Phadking to Lukla. Early morning trek from Phadking to Lukla. We walk for 4-5hours. Explore around and rest overnight. Today after breakfast we fly a scenic flight from Lukla all the way to Kathmandu valley. Explore around valley and rest overnight. Hope you enjoyed your trek to Everest region. Farewell. This is a very cool tourism. No money, justice! The guide led next let's have a fond memories of! We're 10 people team. 12 days EVEREST BASE CAMP, the hiking happy makes me feel is a good memory! Next time again to find the company name in the Adventure Vision Treks and Travel. The responsible officer Mr. Jiban, local Nepal, is very hardworking, frugal and employment success at a young age! I'll back!